Photo from the Dallas Karting Complex. Dallas, evening of March 27, 2014. Photographer unidentified. David Worthington. Funny thing is, this photo probably didn’t require much processing to look like this. Advances in lighting, especially LEDs and color, mean that Dallas’s skyline can look much like this any night. Just add a thunderhead to the northeast, and voila! A vertical panorama — neat idea. This is the building that, just hours before, had been crowded by thousands of people hoping to get into the Texas Senate Chamber to see Sen. Wendy Davis’s filibuster. Look carefully, and you can see that the guides in the Capitol don’t lie — the star on the dome reflects the star on the floor (or vice versa). Can you get a similar shot of the rotunda of your state capitol? Would you do it and send it in, or post it and give us the link? Tip of the old scrub brush to Reeve Hamilton. Neither Ansel Adams nor Georgia O’Keefe noted the power lines, or the gas meter. They must be recent additions. The essential beauty of the church remains. The original adobe construction of the church was completed in 1772 — four years prior to the Declaration of Independence. It is built in the shape of a cross, but structural weaknesses required the addition of buttresses, shown in the photograph — also of adobe. A bad photograph of the church is almost impossible. The interior is cool on a hot afternoon. 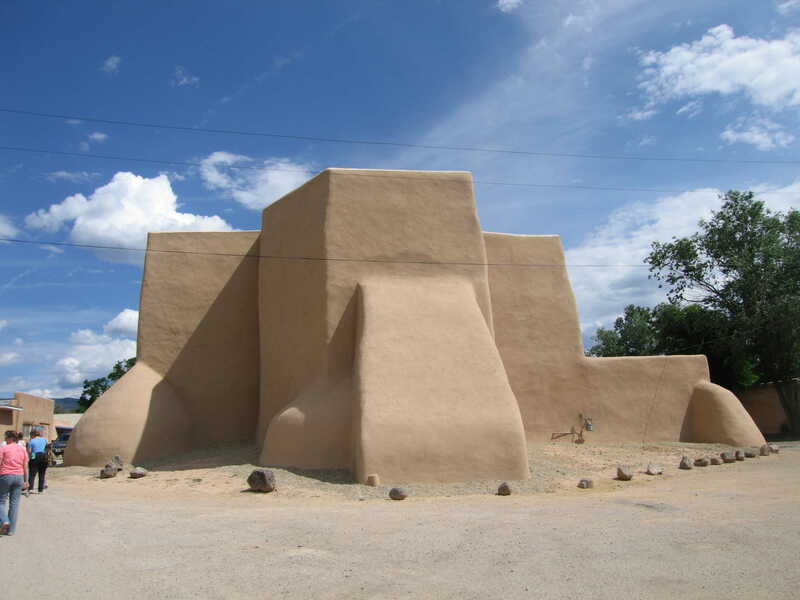 Adobe construction offers significant advantages, even in the 21st century. The church hosts an active congregation, without air conditioning. Photo: Copyright 2007, Ed Darrell; you may reproduce for educational or non-profit use, so long as attribution is attached. Attribution must be attached. Welcome, visitors! Please leave a comment, at least tell why you visited, and where you’re from. Thank you.